To encourage people to live in the moment, Bali resort BANS phones | SHEmazing! Ah, Bali. Arguably one of the most naturally beautiful places in the entire world. The Indonesian island has gained popularity as a tourist destination dramatically over the past decade, thanks in part to social media. The island's beauty and reputation as a vacation paradise is more known than ever before thanks to aspirational travel pages on Instagram, and influencers jetting off and snapping the perfect white-sand-blue-sky beach snap. The gorgeous natural landscape has been enjoyed by travellers for generations, but more than ever it is being enjoyed through a smartphone screen – and one luxury resort wants to put an end to that culture and encourage wanderlusters to live in the moment. 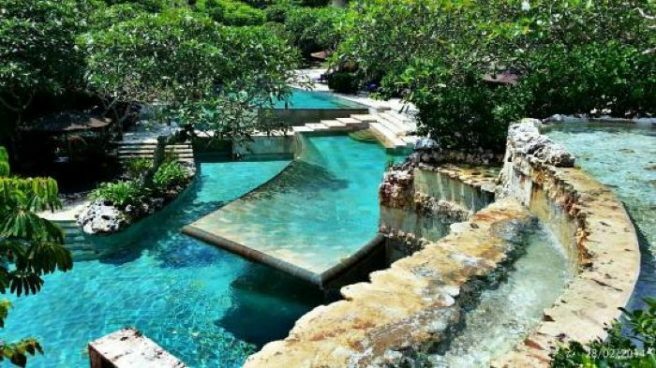 The Ayana Resort has banned smart phones from its stunning River Pool – which is well documented on Insta – to encourage tranquillity. 'The ethos of River Pool is to create a place of tranquillity, where our guests can truly relax and be ‘in the moment’ reads the resort's website. 'When I was last at the Ayana, everyone around the pool had a phone in hand,' said Leslie Patrick Moore, who reviewed the hotel for traveller.com. With social media becoming more invasive by the day, perhaps more resorts will follow in this popular Honeymoon destinations (sandy) footsteps.